At the Building Industry and Land Development Association, we have a number of members who are pushing the limits, stretching expectations and asking the people they work with to think differently about sustainability. In building 40,000 homes every year across the GTA, the industry is required to meet a myriad of standards but the real go-getters set out to exceed them. Since this magazine issue focuses on communities, relationships and the importance of working together through the planning, development and home building process, I decided to phone up one of our members who did just that about five years ago. 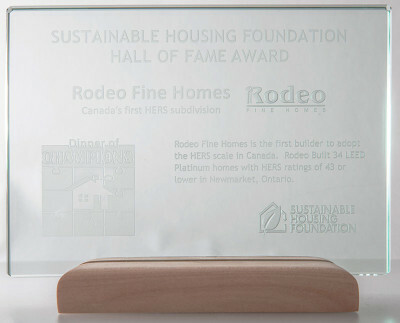 In 2007, Rodeo Fine Homes began construction on its EcoLogic community in the Town of Newmarket. At the time, I was Commissioner of Planning and Development Services for York Region and I remember the Town’s intention to sell the land to a builder that would work with them to set the sustainability bar a little higher. Well, these guys certainly did that. I strolled through the development with William Mauro, son of Frank, who owns Rodeo with partner Vince Naccarato, a few weeks ago. It was encouraging to see and hear how Canada’s first residential subdivision to be certified as LEED platinum is doing years later. These 34 homes achieve and exceed specific environmental targets. Including a 50 per cent reduction in household gas production and energy consumption compared to conventional homes. To meet these targets, the builder had to work with the Town Staff to do research and get educated on new technologies and practices. Then it was a matter of educating the trades as well. From the eco concrete foundation walls with heavy-duty damp proofing, drainage layer and weeping tiles, to the increased insulation levels throughout the building envelope, to the rainwater harvesting cistern for every home, the structure set the stage for the holistic re-thinking of resources, waste and energy use. Each home is also outfitted with solar thermal hot water preheat, vinyl casement low-e2 thermo pane windows, three-foot overhangs for solar shading and interlocking permeable concrete stone for driveways. I could go on but I have to say that when I asked William about the homeowner’s perspective on all the features, he told me that residents will often remark on their low gas, electric and water bills—and for our industry, that says a lot. With these EcoLogic homes and other projects that have reached beyond, we’ve got some answers—and with the recent changes to the Ontario Building Code to increase standards for energy efficiency, we can show examples and work with out municipal, regional and industry partners to meet and exceed them. This entry was posted in News on July 1, 2012 by admin.